On Monday, November 13, 2017, Saban Community Clinic celebrated its 50th Anniversary with a fundraising gala at the Beverly Hilton Hotel in Beverly Hills, honoring Ted Sarandos, Chief Content Officer of Netflix, and Peter Benedek, Founding Partner and Board Member of United Talent Agency, for their philanthropic leadership. Top TV industry executives and celebrities who attended the dinner gala, hosted by the Friends of Saban Community Clinic, the Clinic’s fundraising arm, raised $4.6 million for its healthcare services. Media mogul and philanthropist Haim Saban and his wife, author and artist Cheryl Saban, matched that amount — bringing the fundraising total to $9.2 million! “The work of the Clinic is critically important. We are truly inspired [by the stories we heard tonight] and are honored to do our part,” said Cheryl Saban. Proceeds from the event benefit the Clinic’s low-income and uninsured patients. Last year, the Clinic provided more than 100,000 patient visits. The much-needed funds will also be applied to the Clinic’s renovation project, scheduled to break ground in 2018, to help meet the community’s growing demand for services. Founded as The Los Angeles Free Clinic in the historic “1967 Summer of Love,” the Clinic was built on the principle that health care is a right, not a privilege. Over the past 50 years, the Clinic has grown from a single storefront operation to a three-site, federally-qualified, non-profit organization providing quality, affordable access to comprehensive medical, dental, and behavioral health services. 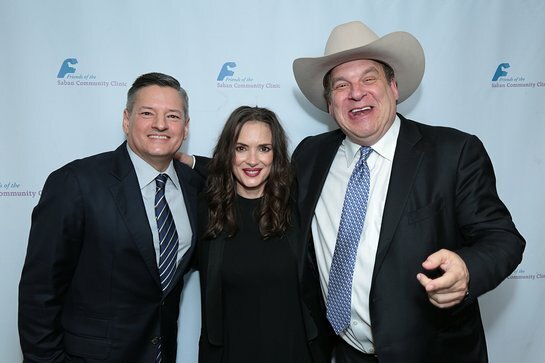 This year’s fundraiser featured actor/comedian Jeff Garlin, ABC’s “The Goldbergs” and HBO’s Curb Your Enthusiasm, as the evening’s host; comedian Norm MacDonald; and the participation of actor/singer LL Cool J, actress Winona Ryder, and singer-songwriter Michelle Phillips of The Mamas and the Papas. Guests were treated to a very special live performance by legendary entertainer Tony Bennett. The event was chaired by Friends Board Members Ellen Hoberman; Tom Hoberman, Partner, Hansen, Jacobson, Teller, Hoberman, Newman, Warren, Richman, Rush, Kaller & Gellman L.L.P. ; Sam Fischer, Partner, Ziffren Brittenham, LLP; and Bela Bajaria, Vice President of Content, Netflix. 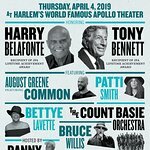 Honorary Dinner Chairs included: Shelli and Irving Azoff, CEO, Azoff Music Management; Jim Gianopulos, CEO, Paramount Pictures; Reed Hastings, CEO, Netflix; and Cheryl and Haim Saban. An active supporter of the Clinic, Ted Sarandos was recognized for his philanthropic leadership. As Chief Content Officer of Netflix, Sarandos has led the transformation of Netflix into an original content powerhouse. With more than 20 years of experience in the home entertainment business, he is recognized as a key innovator in the acquisition and distribution of films and television programs. Saban Community Clinic board member Peter Benedek was presented with the Lenny Somberg Award in memory of the Clinic’s first executive director. The award is presented to a longtime volunteer who embodies Somberg’s courageous vision, leadership and spirit.